A Southern Italian seafood eatery from chef David Pasternack. 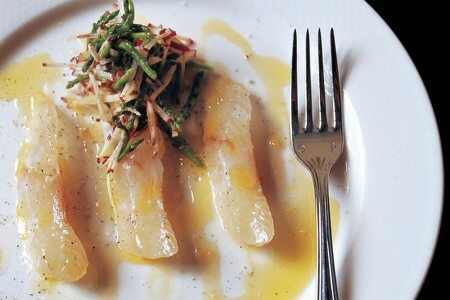 : Esca, a foray into seafood from chef David Pasternack, has become a Theater District standby. In the room of cream-colored walls and wood floors, the menu is all Southern Italian seafood. The crudo section is for food that's as fresh as it gets: slices of raw fish are served with little more than a slick of olive oil and some spices that bring out every ounce of flavor. Octopus is grilled and paired with rosemary-flecked Corona beans, while house-made maccheroni alla chitarra come dotted with sea urchin and crab meat. Crispy zucchini flowers get stuffed with goat cheese and arrive with a salad of California figs and fennel. Larger plates might include whole roasted black sea bass for one or two with caper berries and olives. For dessert, guests will find house-made gelati and sheep’s milk ricotta cheesecake. Panna cotta is light, and topped with sweet strawberries. Esca uses the Coravin system, which allows the restaurant to offer glasses from expensive and/or rare bottles of wine. Among the craft cocktails is the L'ultima Parola, a mix of Plymouth Gin, Chartreuse, lime and cherry.